Bring out the big kid in you! Blast from the past - this is a fantastic product will effectively promote your business or event! 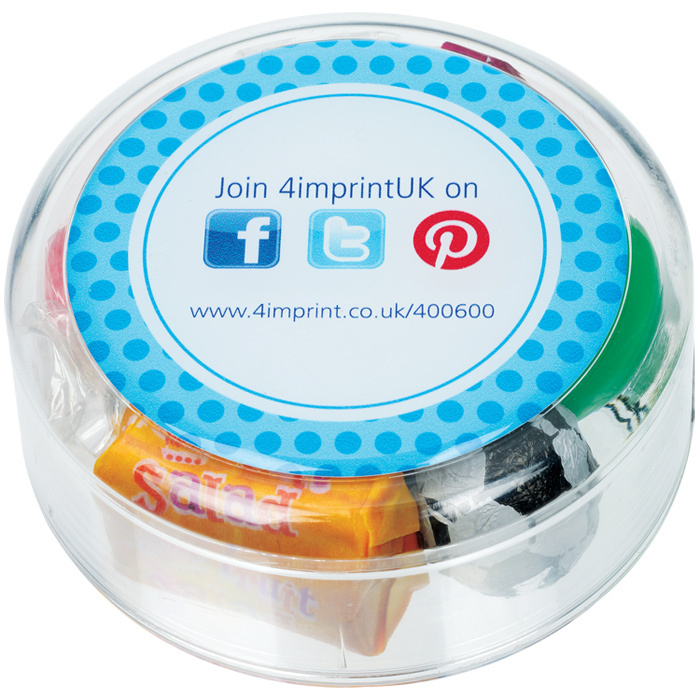 Cute, round pot of retro sweets that is sure to put a smile onto your customer's faces. Contents may vary slightly, treats include Love Hearts, Fruit Salad chew, Blackjack chew, rhubarb and custard, chocolate ball (foil wrappers may vary) and gobstopper. Once the sweet treats are gone the great quality pot can be used for paper clips etc. Product may contain milk, traces of nuts and soya. Price includes a full colour print onto a high-gloss domed sticker which is adhered to the lid. Dimensions: 65mm diameter x 25mm.